One of the most fertile of possible futures in music involves fusions of well known popular western forms (jazz, rock, folk, etc.) and the music of various cultures around the world – with their song stylings and musical instruments, the possibilities become nearly limitless. The Beatles and the Stones recognized this, and for a short period in the 60s the work of both bands (and many more who followed) were enhanced by this infusion from other cultures. Likewise in jazz, a similar phenomena was in progress as that style was exported to other parts of the world, like Africa, Cuba, and Brazil (just three examples), accepted into those cultures, fused with their own music, and eventually brought back home. And then there was John McLaughlin and Shakti, and the emergence of world jazz groups like Embryo, Piirpauke, Oriental Wind, and others, and these cross-cultural progressive styles continue to develop. Along the way some artists have developed their own sound within certain given parameters and established themselves there, such as the Gypsy Kings, and become quite popular in the process. 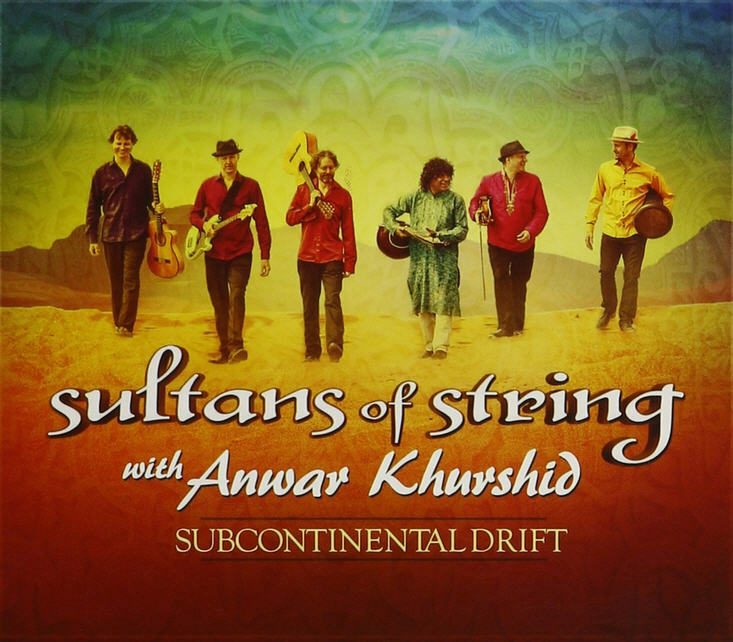 The Sultans of String, a Toronto based five-piece that came together around 2006 may be poised to travel a similar path, and although their sound is quite different, it has the potential for a similar mass appeal. The band is led by violinist Chris McKhool (who also handles production), and features two guitarists, bass, drums, and percussion, and all members share vocal duties. For this release they are joined by featured master sitarist Anwar Kurshid, tabla player Ravi Naimpally, and a number of additional vocalists who are likely handling the songs that are sung in different languages. At first listen, one might be reminded of Azigza, a group we are well familiar with here at Exposé (probably because of the Sultans’ prominent use of violin, viola, and such in a similar context), but with many other influences at work throughout these ten tracks (Celtic jigs and reels, ragas, Gypsy-jazz, Arabic, Cuban and South Asian styles and rhythms, as well as regular old folk music on tracks like “Blowin’ in the Wind” and “A Place to Call Home”) after repeated listens a larger pan-cultural sound emerges that is often brilliant and highly original, and the sounds are changed enough from one cut to the next that it never gets samey or tiring. I haven’t heard and of their four previous releases, but for listeners who are open to getting off the standard rock, jazz, and fusion path, this one is most definitely worthy of further investigation.